Consumer experience encompasses every aspect of a company’s offering and public image—the quality of design, the thoughtfulness of product features, the touch and feel, the satisfaction experienced during use; it makes a difference. But every user has a different viewpoint on the perfect fit, the perfect design, the function, acceptance based on their personal experiences. How then should a product be designed to fit the broad spectrum of consumer’s expectations and needs? At TKDG we invest time and talent to identify user needs that are ignored, overlooked, unrealized. We visualize the consumer’s experience with a unique combination of research and three dimensional design evolutions. Our method of discovery, design research, and prototype experimentation generates products that respond to the user / transformational design that engages the consumer. Industrial Design Challenge: Develop an innovative form factor that reduces the size of the portable garment steamer by 40% for a compact presence in luggage but maintain exactly the same steam -time output. The client presented us with a difficult technical challenge and we found a unique solution that was smaller, compact and functioned better than their previous product. TKDG design included patented retractable pivoting handles that nest neatly into the housing for compact storage yet providing comfortable insulation from heat. All of the new design features added safety, comfort, and security from scalding. To supplement product design TKDG developed a branding approach that leveraged the unique look of the product. Straw cap is designed for optimal user convenience with one-hand operation and spill proof sipping. The bottle is shock proof glass covered with a slip-resistant silicon sleeve that prevents breakage. Collective belief of purity and safety with our client, TKDG ensured the cap design won't impact any unpleasant taste to the beverage. Committed to sustainability, all component materials were carefully selected: Medical grade silicone, cap is BPA/BPS free and phthalate free. The cap components are manufactured and assembled in the U.S.
TKDG designed an elegant alternative to ice cubes. Teroforma wanted a product design that would present a refined elegant presence in the wine glass, prolong the chilled wine temperature, and complement the experience of sipping fine white wine. Wine Twirls incorporates phase change technology within a unique capsule design. The form complements the wine and the glass. Industrial Design Challenge: Design an unbreakable ice scraper with patentable features that Prestone could market as the “best ice scraper in the world.” TKDG set out to study what is wrong with just about every ice scraper on the market. It was simple, they really do not work. TKDG applied physic to make a design that works. 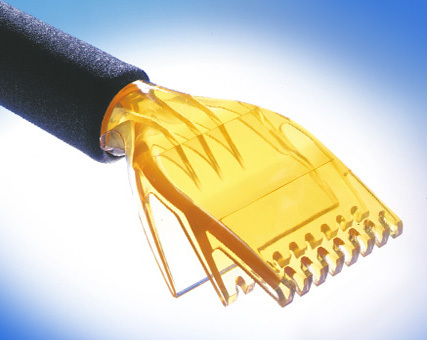 The patented, ergonomic design of the PolarClaw™ Ice Scraper has three blades, the top two of which are staggered to fracture ice quickly and the third blade is designed to wipe away the ice fragments outperforming every other scraper. TKDG’s industrial design services encompassed final manufacturing design and sourcing of domestic manufacturers for molding and assembly; manufacturing was price competitive with overseas companies. Industrial Design Challenge: Design an office furniture system introducing new concepts that expand flexibility and functionality of office workstations. Working in concert with architect Robert Allen and GEIGER International, TKDG developed innovative industrial design components including moveable rolling work tables, textured diffusers, overhead storage areas, and an elegant array of contrasting and complimenting materials. The project scope included engineering services for the mechanism and structural components. Industrial Design Challenge: Design a garden hose sprayer that would create a new aesthetic standard, while costing less than $1 to manufacture. TKDG developed a cost-effective industrial design that for the first time incorporated ergonomic design and branding features into the generic garden consumer products category where the focus had exclusively been on functionality. TKDG applied product user interface design principles including tactile considerations allowing the product to cradle the hand and minimize pressure points and stress. The design also featured a unique water-saving feature, a multi-pattern nozzle, and a patented simple lock on/off feature. Industrial Design Challenge: Create an innovative new design for highlighting markers that would be more comfortable and aesthetically appealing than the mundane highlighter. TKDG created an entirely new concept for this product shape based on user research and prototype experimentation. The PaperMate highlighter conforms to multiple hand grip postures and aligns the tip of the marker to the page. TKDG introduced the client to a novel molding process used in the cosmetics industry to obtain the desired form factor, reduce cost, and overcome manufacturing assembly challenges. Industrial Design Challenge: Esselte wanted a complete facelift on their plastic portfolio collection to replace the dull and ordinary design that had been in place for years. But, they did not want to make major investments for tooling or manufacturing methods. There are times when design innovation has to be reconsidered creatively managing with many constraints. TKDG looked at materials, surface finishes, details, color, pattern printing and embossing on the exterior surfaces leaving the functional interior intact. TKDG developed a sturdy but attractive plastic portfolio exterior that protects and rebrands in a substance, imparting depth, indelible character and the feel of quality. The challenge given to TKDG was to design consumer appealing products without changing existing manufacturing process. With the constraint, TKDG created a elegant product line of portfolios that are simple but treated with thoughtful details that deliver character and quality. Industrial Design Challenge: Design a unique hand held shower to enable physically challenged users to shower themselves, alone, with safety, dignity and ease. TKDG industrial design applied hand grip strength considerations to produce an innovative body design with a unique pressure activated safety handle; this requires no grip strength or fine motor coordination to hold and activate. It is quite functional for able body users as well as physically challenged users; no stigma or compromises. This design received awards in the US and Europe and was featured in a Cooper Hewitt National Design Museum show on Universal Design. Industrial Design Challenge: Design a kitchen sink strainer that would be functional and playful leading everyday mundane chore a little more fun. TKDG design incorporated innovative design geometry based on the material properties of molded silicone. The result was a silicone form that enabled the Kitchen Sink Strainer to be easily turned inside out for quick cleaning and easy to pick up.